See that practical family car sitting in your driveway? It has competition oozing through its electrical and fluid-filled veins. How? Much of the modern driving technology we enjoy in the cars we drive daily was developed in the unforgiving arena of auto racing — everything from disc brakes and seatbelts to clutch-less transmissions and adaptive suspensions. Next year, another technology will trickle down from the world of auto racing: wireless electric vehicle charging (WEVC). Qualcomm Halo uses resonant magnetic induction to transfer energy, wirelessly, from a ground-based pad to another pad integrated in the vehicle. Energy is transferred quickly and safely to an automobile’s battery. Just as important, energy is transferred efficiency — Qualcomm Halo is comparable to conductive charging’s 90% efficiency rating, but Qualcomm Halo’s efficiency improves as the level of wireless charging power is turned up. Qualcomm, through its subsidiary Qualcomm Technologies (QTI), already works closely with the Mercedes factory Formula One team, Mercedes AMG Petronas. QTI’s work with the team has resulted in speed, efficiency, and safety improvements using racecar data sharing over Wi-Fi. 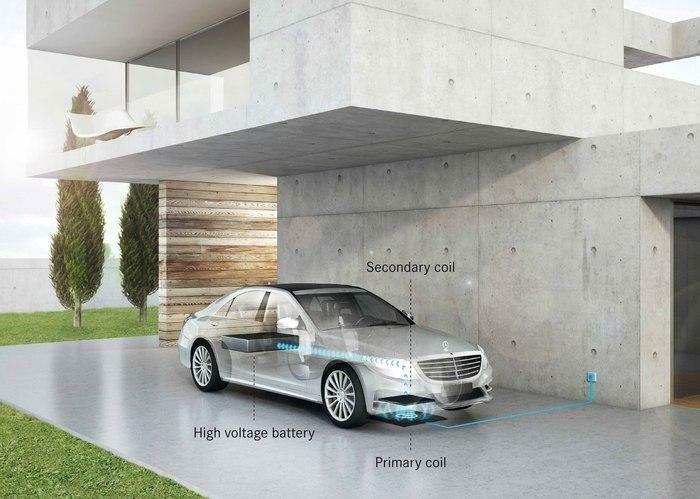 In 2015, Qualcomm and Daimler issued a joint statement outlining the overall WEVC focus, which includes developing quicker, more powerful charging for pure EVs. The benefits of these developments will likely resonate with more than just Mercedes-Benz owners. The companies, along with other OEMs, are working together to ensure that WEVC technology is included in SAE International’s automotive standards, for short- and long-term benefits. In the short term, proving WEVC’s commercial power will help expand the exploration for its use in pure EVs, which have more demanding batteries than their hybrid counterparts. While the 3.6 kW WEVC system is perfectly adequate to charge a plug-in-hybrid battery, a pure EV with a 30-40 kWh battery needs double or even triple the charging power to fill up in a reasonable amount of time. In the long term, it marks an important step in making self-driving cars truly autonomous – you cannot call a car “autonomous” if it cannot fuel/recharge itself. With its extended dedication to automotive innovation, Qualcomm is an important technology partner for every automotive company looking to apply advanced technologies to their fleet. Editor's Note: The OnQ Team has corrected the content to clarify that this technology will be available as an option in the 2018 Mercedes S550e.